Many of my readers may remember that I wrote a piece called “Non-Refugee Refugees: Tibetans’ struggles for visibility in bureaucratic India,” on Lhakar Diaries last year. The subject of the essay concentrates on marital unions between Tibetans and westerners that offered some Tibetans possibilities of documents that could help them escape their precarious existence as, what I termed, “non-refugee refugees.” Sometime after that post, I began seeing several Facebook posts by expats living in Dharamsala for the self-published book Dharamsala Days Dharamsala Nights by Pauline MacDonald (a pseudonym). I was told by friends that the book was on the subject of newcomers in Dharamsala, including male newcomers’ relationships with female Injis. I was able to get my hands on a copy, but only just found the time to read it. Upon finishing the book, I couldn’t help but write an FB commentary on the sloppiness of MacDonald’s analysis. The FB thread was soon followed by some responses. One of the responders, Ben Joffe, a friend and a fellow CU Boulder PhD student of Carole McGranahan who studies Tibet, has allowed me to publish his review of the book in my post. But before readers can get into Ben’s review, I’d like to make some of my thoughts clear. 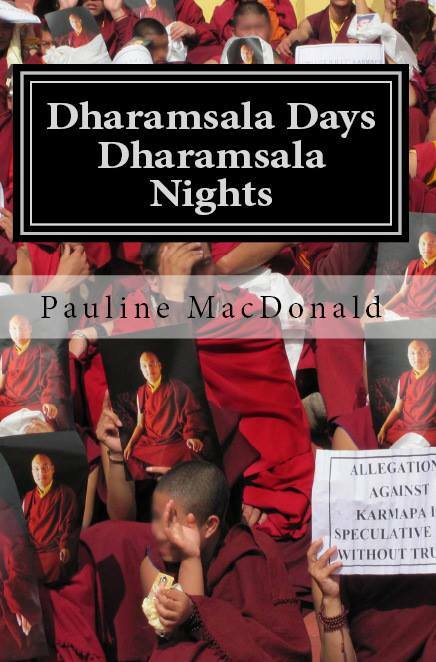 Although MacDonald’s tone is one of good intention and conviction to tell the hardships and stigmas that newcomers from Tibet face in McLeod-Dharmsala, my main problem with her book was that she decides to choose sides: she favors newcomers over exile Tibetans, and even further makes exile Tibetans, whom she calls “settlers,” the villains. Choosing a side requires categorizing the two groups as single entities at odds with each other. This doesn’t allow room for complexities within and between the group, and also ignores complexities that create tensions between the groups in the first place. In her account, she paints all newcomers into a single entity known as the “Sali gyals,” whom she describes as newcomer men out on the prowl for western female partners. She portrays exile Tibetans as an similarly homogenous merger of CTA/activists and India or Nepal-born Tibetans. Although she tries to create a more sympathetic and complex character of the newcomer by sharing stories of their personal struggles and pains that she was exposed to, she ultimately depicts them as hopeless characters doomed to fail whether in business, relationship, and so on. In her analysis, these failires are because of “settler” Tibetans, not because of the precarious status of Tibetans as non-refugee refugees (or of most Tibetans in India or Nepal, newcomers or not). Aside from a few people throughout the book, exile Tibetans are portrayed by MacDonald as characters without complexities although poor Tibetans face different kinds of stigmas too. Such characterization of Sali gyals–a term she uses interchangeably with “newcomer”–as hopeless characters misses experiences of newcomers who are women, students at the College of Higher Tibetan Studies Sarah, and families thriving in places such as Norbulingka, all of whom are situated also in Dharamala. While I acknowledge with MacDonald that newcomers occupy a more vulnerable status than RC and IC-holding exile Tibetans, her one dimensional characterization of newcomers misses the impact of newcomers as initiators of cultural change in Dharamsala, whether in fashion (Amdo and Khampa chupas becoming popular), music (from Tibet), or food (Amdo restaurants). The lack of analysis of exile as an entity, identity, and status without much resources or rights does a disservice in contextualizing how this adds to the stigma that MacDonald describes. Narratives shared to MacDonald by newcomer Tibetans are important in that they bring to light certain subjectivities within the exile Dharamsala community that need to be heard and addressed. MacDonald’s discussions on the different types of tourists that converge in Dharamsala seeking certain kinds of exotic are also potential topics that could lend itself to discussions on how the capitalist tourist economy allows certain raced and classed bodies/cultures to become consumed (Tibetans) due to precarious circumstances, while other privileged bodies could become the ones consuming those bodies, cultures, and experiences (western tourists and expats). Power in this discussion is central for all characters, the tourists, Indian locals, exiles, and newly arrived Tibetans. The book doesn’t necessarily go there, mostly because as Ben discusses below, the author’s direction of the book is itself confusing. She does, however, do a good job detailing lives of the men she becomes close with and the western characters that populate their lives, including herself. This book is most successful as a personal story rather than a sociopolitical analysis. Newcomers’ experiences outside of Dharamsala are also not a part of the story here, but should be. MacDonald offers an opening, problematic though it is, for further research and writing on newcomer issues in the Tibetan exile community. I know McDonald well, she is a good friend of mine, so it’s difficult for me to critique this book. Still, I feel like I ought to register my reservations and reactions honestly and fairly. Dawa really hits the nail on the head with the issue of often un-nuanced polarizing of exile-born vs. sarjorpas and the politics and rhetoric of most-deserving victim at work here. One of my chief difficulties with the book is what feels like its inconsistent genre and register. The book struggles to decide on its voice as a travelogue, personal memoir and set of personal reflections on Dharamsala, contribution to exile oral history, or critique of the Tibetan exile administrations and its policies. The best parts of the book are where we get to read about the experiences McDonald is most qualified to speak about: the travails of those sarjorpa who married non-Tibetans and immigrated abroad, and the weird and wonderful mix of people that make up McLeod’s more or less transient population. Beyond this though, as Dawa mentions, McDonald’s totalizing account of sarjorpas vs the CTA/exile Tibetans strikes me as too homogenizing and de-contextualized. Everyday prejudice against sarjorpa by exile-born Tibetans gets projected onto the CTA, which comes across as a largely monolithic if not maniacal entity (in no small part through McDonald using the central villain of Samdhong Rinpoche as its metonym). At times it would seem McDonald would have us believe the CTA is set on sending sarjorpa back to Tibet out of sheer malice or disregard. This conspiratorial tone and her frequent literary recourse to shock and outrage leave little room for a fuller discussion of the relative power and resource-lessness of the exile administration to secure RCs for newcomers and to guarantee protections for any and all of its refugee de facto citizens. What negotiating power does the exile administrative really have to convince the government of India to offer sarjorpa RCs and increased protections? We hear about the discontinuation of RCs but not much about the actual negotiations around this. Talking about sarjorpa in exile is important, necessary, long-overdue but at times the complexities of exile Tibetan policies and political activities and the range of relationships between multiple demographics gets sacrificed in favor of McDonald’s preferred, simpler tale of heartless exile-born ‘settler’ Tibetans and their disregard for newcomers, who in the final analysis, seem helpless unless and until they escape Tibetan exile communities. Ultimately, I worry that, for all of McDonald’s obviously good intentions, the tone and level that she pitches her critique will prove more harmful and distracting than eye-opening and transformative like she would like. I think McDonald would like to do the same, but each reader will have to decide how successfully and fully she accomplishes this, and with what consequences. For me, the book is uneven in its ‘critiquing with’ and as invalidation, as well as in its genre/project, in a way that makes it hard for me to know just how to recommend and/or critique it as a work myself. McDonald has said that she felt compelled to write the book because no one else had addressed these issues fully, and I know she worked very hard and with a strong sense of commitment and conscience on bringing important issues to light. Still, McDonald makes it clear throughout that she knows that her brand of critique amounts to bridge-burning. Her keen awareness of the protection and privilege that her non-academic, non-Tibetan position provides her suggests that she herself knows very well that much of her writing is critique not with but against. This is her prerogative, but we as readers must decide how much of each kind of critique we feel is necessary and useful in talking about sensitive issues that affect a vulnerable highly visible population of which we are or are not a part. I knew both of Ben and McDonald for years and plus I read this book in very detail. I am a newcomer but I spent most of my time with settlers in Dharamsala, Delhi and South India. Living in tourists guest houses, eating in expensive restaurants and talking with Tibetans over tea or coffee, interviewing with some Tibetan guys etc,,,,,,what so ever, this is very much surface level of Tibetan society of Dharamsala. In deep down, you will, many times, see a different reality. It seems you didn’t read her book in detail, McDonald clearly mentioned that she didn’t cover the issues of Tibetan people outside of Dharamsala because she didn’t have enough time and enough money to travel. She also wrote the complexity of Dharamsala society throughout her book and interpreted them through different personalities as a witness. If you don’t know the society of Dharamsala, then, not necessarily to put your noise in every topic. First, study and analyse, then give comment on others ! I second Ben’s recommendation that you read the review thoroughly, and also maybe take a look at my ‘Non-Refugee Refugees’ article in which you will realize that we actually agree with you on the importance of bringing to light the stigma’s newcomers face. However, if Pauline writes a book on Tibetans, in which she accuses the exile polity of carrying out human rights violations against newcomers, then she shouldn’t be surprised when a Tibetan then decides to reviews such assumptions that lack critical research, explanation or analysis. The pressures in Dharamsala are enormous, and this book has a lovely way of bringing the inevitable humour of Tibetans through her recounting of first person events, perceptions and reactions. There is something in this for all Embassies and Police agencies to read in shame. If all she (‘P McD’) writes about is true, then this is an even greater impetus for foreign nations to invite even more Tibetan refugees, for study abroad, passports – and lives lived without fear. I think this book would amuse and support those western women married to Tibetans, who come in all colours shapes and sizes, and give their western friends greater understanding, remind Tibetans in exile not to EVER lose their compassion for their countrymen when they attain a position of comfort, and give greater confidence to those trying to survive in, and escape from, a situation which is essentially a shameful global rip-off for Tibet. I think she bravely did well with this book, exposed herself, and it has in no way turned me off fighting every day for the Tibetan right to freedom after 60 years of what can only be called attempted genocide by a dominant nation which perpetuates tremendous cruelty, then sends their kids to Western countries to largely go shopping. From all angles, and even as time and conditions and people have moved, on, it is an historical record that has great significance and value. And let’s face it, if even ONE Tibetan lost their life being forced to return, that should be an international human rights matter. But is it? Looking at the June 2014 traffic and conditions in Dharamsala, I doubt that this book would even register in a nation that can spend hundreds of millions sending a piece of machinery to Mars, but cannot protect women and girls by law, wash and house and school hordes of begger children, or build one decent permanent road here. India is 1.4 billion, and has its own deep issues, Surely all nations should take ALL Tibetans who want to leave, now.